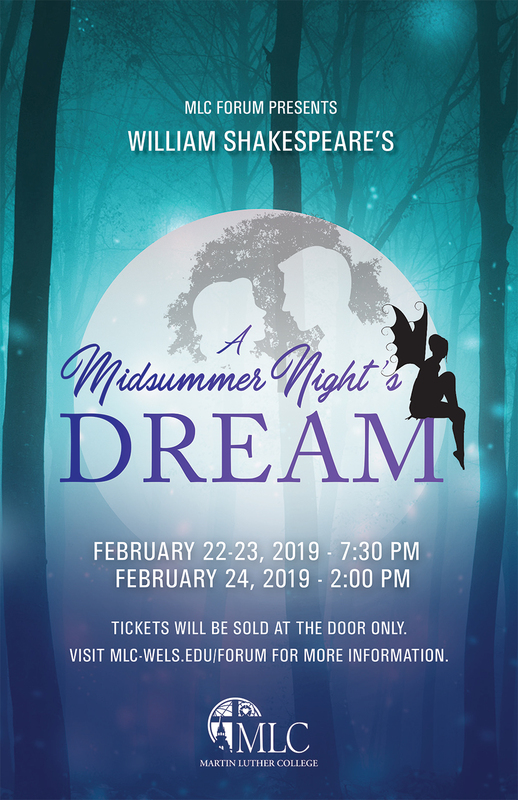 The MLC Forum presents their winter play, A Midsummer Night’s Dream, Friday and Saturday, February 22&23, at 7:30 pm and Sunday, February 24 at 2:00 pm in the MLC Auditorium. NOTE: The main entrance to our auditorium across from the chapel is under construction. Please use one of the other main entrances in the Wittenberg Collegiate Center and follow the signs to our ticketing table on the north side of the auditorium. Love is in the air in the city of Athens, but it is not without its complications. A young woman wants to marry her true love, but her father has chosen someone else. A young man is pursued by a young woman in whom he is not interested. The king and queen of the fairies are fighting, causing chaos all around them. A group of amateur actors are rehearsing a play for the wedding of the duke and duchess, only to be foiled by their own inadequacies. A group of friends find themselves in a love quadrangle facilitated by a mischievous fairy. What will come of this strain between friends, lovers, and strangers, and between the fairy world and human world? In William Shakespeare’s widely performed classic, A Midsummer Night’s Dream, love can make fools of us all, but it may also win out in the end.